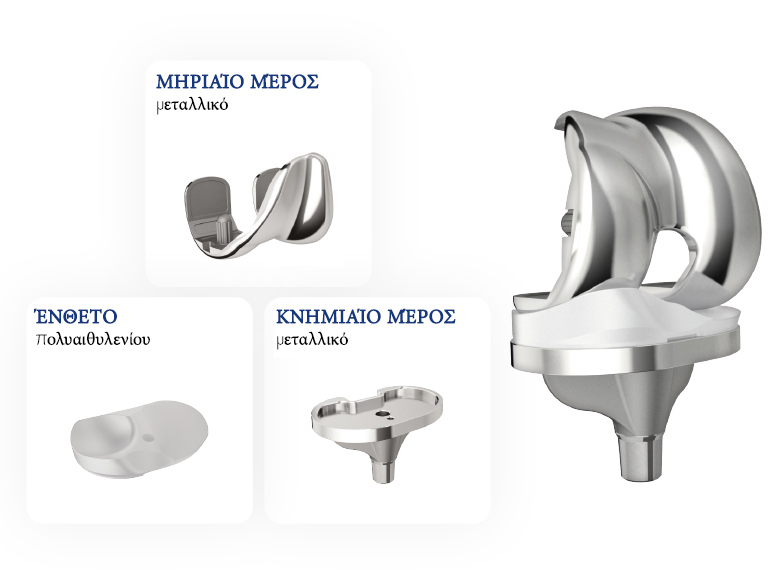 Total knee replacement surgery aims at substituting the bone and cartilage of the joint damaged by arthrosis with plastic and metallic components. The surfaces of the thigh and shin bones are replaced with high-resistant metallic components, called the femoral component and tibial baseplate. Between the femoral component and the tibial baseplate, a plastic insert is implanted. It replaces the cartilage function allowing the thigh and shin bone to slide on each other. All materials used in a total knee replacement are highly biocompatible. With almost 50 years of history, total knee replacement surgery is a very common and safe procedure for the treatment of severe arthrosis. Approximately 1.000.000 knee replacements are performed annually worldwide. The pain will be rapidly and dramatically reduced and usually eliminated. With less effort, you will regain close to the original mobility of your knee.